Only five tunes were originally collected in Ducklington, and, of those, only four are known for certain to have been used for dancing, these being Jockey To The Fair, The Nutting Girl, Old Taylor (of which two subtly different versions were collected), and The Princess Royal. It is not known whether the fifth tune, The Lollipop Man, was originally used for dancing or not, but we now use it for our processional dance. Of the other tunes we use, most are borrowed from related morris traditions, although a few are from further afield, or composed within the side. As has been noted elsewhere, the music for Ducklington is played very slowly compared with some other traditions. Although the exact speed varies from dance to dance, and according to other factors such as the dancing surface, a speed of about 60 beats per minute is fairly typical. However, the exact speed of the music is not completely constant. Some steps and figures may require that the music be either sped up or slowed down slightly to make them easier to dance. For those figures where not everyone is dancing simultaneously, the musician may also vary the speed depending on who is dancing at the time, as different dancers with different levels of fitness or expertise may be able to dance at slightly different speeds. In fact, this variation in the ideal speed is, to some extent, common to any cotswold morris, but our slower style makes the variation all the more essential, and far more pronounced. All of these variations in the speed mean that the musician must be very attentive to the dancers. It is a peculiar skill, which not all musicians have occasion to learn (especially not those who have not played for dancing), to base the rhythm of one’s playing on watching the movement of a dancer’s feet, rather than on listening to the rhythm of other instruments, or on an internal rhythm in the player’s head. This need for the musician to follow the dancers at least as much as they are following him causes further difficulty if more than one musician is playing, as different musicians may interpret the rhythm of the dancing in subtly different ways, which can lead to the different musicians being confusingly out of time with each other. For this reason, we tend to prefer that either only one musician play at once, or that one lead, and the others follow his playing closely. As with most folk music, conventional music notation can only go so far towards describing the tune; it cannot fully express the way that parts of the tune are emphasised nor the subtleties of the rhythm. Nor should it be regarded as entirely prescriptive of the notes played; in practice the tune is rarely played exactly the same way twice, and so the written music should be taken as a guide to what to play rather than a strict dictation. 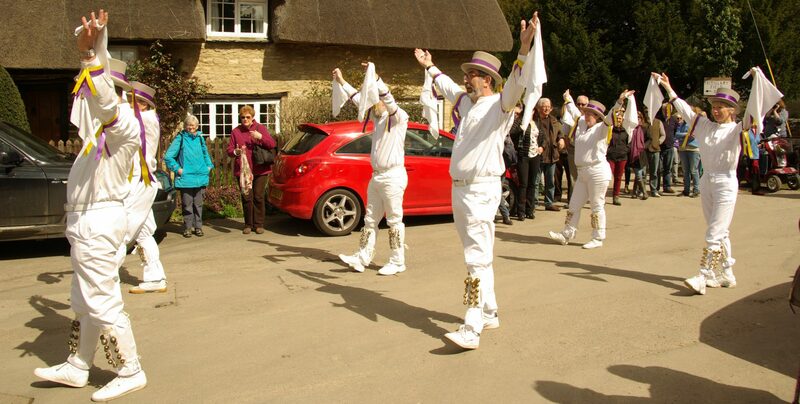 This being said, a morris musician should be wary of allowing musical creativity to override the needs of the dancers. While some twiddles, extra notes and other ornamentation is not only acceptable, but commendable, as it can add rhythmic emphasis and interest to the tune, the musician’s first duty is to the dancers, and the playing should always reflect this. Firstly, the tune should never be so over-ornamented as to be unrecognisable; this can lead to confusion and may be off-putting for the dancers, especially any who are at all unsure of themselves or of the dance. Secondly, the rhythm must always be maintained; the ornamentation should ideally emphasise the natural rhythm of the dance, and should certainly not deviate from it.